in Scoil Mhuire gym, Clane. 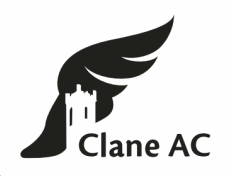 Due to the clubs popularity, sometimes Clane AC have to operate a waiting list for new members in certain age categories. Our team of coaches are constantly reviewing the age groups and coach allocation to see if we have more space available. If you wish to enquire about availability or place your child on the waiting list, please contact the club registrar, Niall Heffernan via this websites email or on our facebook page, and if we have a place available, we will be in touch with you. Remember, we are completely a volunteer club. We are always looking for and welcoming new coaches and assistants. Please contact us if you might be interested in helping out the club. The more helpers & coaches we have, means we can free up more spaces for your children to train with us. Contact us if you think coaching might be for you! To join the club or to renew membership, print off the 2019 Membership Form (see below PDF document), complete and return to any club official with the required fee. ​- Youngest age accepted is U8s i.e for 2019 membership, children must be born in 2012. Entry to All Kildare League, Cross Country & Championship events. Family annual membership (2 adults & 2 or more children): Fixed price of €250. 10 year family membership: €1,000. NOTICE: Juvenile Athletes whose membership is not up to date are not entitled to train with the club and will not be eligible to be entered in competitions. Due to the high demand of places in certain age groups, juvenile members who do not show up for training for over 4 consecutive weeks without an adequate reason for their absence, may be at risk of losing their place. Members just meet up and run in a group, no leader led specific training. This is a beginners running programme - You do not need to be able to run to start this plan, but you do need to have a very basic level of fitness to participate in our beginner C25K running programmes. i.e be able to walk briskly but comfortably for at least 3km. *Membership runs from 1st January - 31st December, regardless of what date in the year that a member joins. This is in line with Athletic Association of Ireland (A.A.I) rules. Please contact our club email: claneathleticclub@gmail.com for any queries on the Adult club. We run a Couch to 5km 7 week programme, three times a year. Please click on the Adult Running club tab on this website, or check in on our Facebook page for announcements on our next session. ​Print off & fill out the form and hand it directly to the juvenile registrar or your running club leader with the fee. If transferring from another club, please notify the club and make a note of this on your registration form. Club transfers take place with the A.AI twice a year - on 1st May and 1st September. It is the responsibility of transferring member to arrange their own transfer, not the incoming club, otherwise they will not be insured to train. County board meetings for Kildare take place once a month in usually in a hotel in Naas or surrounding areas. You can either go to the meeting yourself to get your form signed, or ask another member of your old or new club who will be attending, and have them present your form and get it signed off. Transferring members must have the correct transfer form filled out and all the relevant sections on the form signed and posted off to the Athletic Association of Irelands headquarters in Santry Dublin for processing, well in advance of either cut off date. i.e 1st May or 1st September. See below for the Clane Athletic Club - GDPR - Privacy Statement.